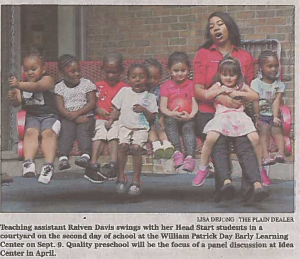 William Patrick Day Head Start teaching assistant Raiven Davis and her students were featured in Sunday’s edition of The Plain Dealer. The photo and article promote the upcoming panel discussion where experts will talk about quality preschool environments and the importance of high-quality early childhood education. That discussion is set for Monday, April 4 at Idea Center in Cleveland. Pancakes with Dad –Extra syrup please!